우리 대학 생명과학과 전상용 교수 연구팀(1저자 이용현 박사)이 신체 내부의 항산화물질을 이용한 새로운 항염증 나노의약품을 개발했다. 빌리루빈이라 불리는 생리활성물질 기반 100나노미터 크기의 나노입자로 이뤄진 이 약품은 만성 및 급성 난치성 염증질환 치료에 쓰일 것으로 기대된다. 이번 연구는 화학분야 저명학술지 ‘앙게반테 케미(Angewandte Chemie international Edition)’ 5월 4일자 온라인 판에 게재됐다. 고분자, 무기 나노입자 등의 많은 나노소재들이 질병 진단 및 치료용 나노의약품으로 개발되고 있다. 그러나 대부분의 약품들은 인공소재로 이뤄져 생분해성 및 생체적합성이 낮다. 이러한 약품들이 신체에 장기간 남을 경우 잠재적인 독성을 유발할 가능성이 있어 실제 임상적용이 되는 예는 소수에 불과하다. 연구팀은 문제 해결을 위해 이미 우리 몸속에 존재하는 항산화 및 면역조절 물질인 빌리루빈을 이용했다. 빌리루빈은 헤모글로빈에 존재하는 산소결합 물질인 헴(Heme)의 최종 대사체이다. 빌리루빈은 노란색 담즙 색소로서 혈중 농도가 높아지면 황달의 원인이 돼 예전에는 쓸데없는 물질로 여겨졌다. 하지만 근래 발표된 역학조사에 따르면 빌리루빈의 혈중 농도가 다소 높으면 심혈관 질환이나 암 발병 가능성이 현저히 낮아진다는 사실이 밝혀졌다. 또한 빌리루빈은 여러 활성산소들을 제거하고 염증과 관련된 면역세포를 조절하는 등의 기능을 해 세포와 조직을 보호한다는 사실이 동물 실험을 통해 확인됐다. 그러나 물에 거의 녹지 않는 특성 때문에 빌리루빈을 실제 치료에 적용하지 못했다. 전 교수 연구팀은 빌리루빈에 초 친수성 고분자인 폴리에틸렌글리콜(PEG)을 결합한 ‘페길화된 빌리루빈’을 합성해 수용액에서 자가 조립돼 약 100나노미터 직경을 갖는 빌리루빈 나노입자로 재탄생시켰다. 이 빌리루빈 나노입자는 항산화 및 항염증 효능을 그대로 유지하면서 신체에 축적되지 않고 배설돼 빌리루빈의 장점만 갖는 나노의약품이 됐다. 효능 확인을 위해 대표적 난치성 만성 염증 질병인 대장염 모델을 쥐에게 투여한 후 빌리루빈 나노입자를 투여했다. 염증이 형성된 부위에 나노입자가 선택적으로 분포됐고 대장염 진행을 효과적으로 차단했다. 또한 장 길이가 짧아지고 혈변 등의 부작용이 생기는 대조군과 다르게 정상 생쥐와 비슷한 수준으로 회복됐고, 황달 등의 부작용이 발생하지 않아 높은 수준의 항염증 효과를 확인했다. 연구팀은 빌리루빈 나노입자가 대장염 모델 외에도 허혈성 간질환, 천식, 췌장소도세포 이식 동물 모델에서 우수한 효과를 보여 향후 범용 항염증 나노의약품이 될 수 있을 것으로 기대된다고 밝혔다. 연구팀은 “빌리루빈 나노입자는 우리 몸속에 존재하는 생리활성물질과 친수성 고분자가 접합된 간단한 화학물질로 구성됐다”며 “생분해성 및 생체적합성이 높고 대량 생산이 가능해 바로 임상 적용이 가능하다”고 말했다. 전 교수는 “향후 국내외 연구진들과 전임상 및 임상실험을 수행할 예정이다”며 “적절한 치료제가 없는 난치성 염증질환을 치료할 수 있는 새로운 나노의약품을 개발해 환자들의 고통을 덜어주고 싶다”고 말했다. 이번 연구는 한국연구재단 글로벌연구실 및 KAIST 시스템헬스케어 사업의 지원을 받아 수행됐다. Fig 1. 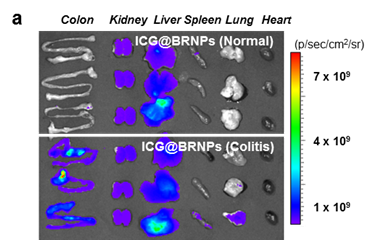 Fluorescent ICG loaded bilirubin is selectively accumulated in inflammatory tissue. Research team of Prof. Sang-Young Jon (Dept. of biological sciences at KAIST) developed de novo anti-inflammatory nano medicine with innate anti-oxidation agent in our body. The drug made of 100-nm nanoparticle based on biomolecule called bilirubin and will be used as a therapeutic drug for chronic and acute intractable inflammation. This research was published on Angewandte Chemie international Edition Online at May 4th. Although a bunch of nano medicine made of high-molecular inorganic nanoparticle has been developed for diagnosis and therapy, majority of them is accumulated into body to elicit toxicity. Because of its toxicity, few medicine can be used in clinic. To solve the problem, the research team took advantage of bilirubin which is innately synthesized in our body to control immune system. The bilirubin is a final metabolic products of Heme. Because the bilirubin is a cause of jaundice, it has been considered as a useless material in former days. However, recent studies revealed that high blood bilirubin concentration decreases probability of cancer and cardiovascular disorder. Subsequent animal study confirm its anti-oxidation effect to protect cell and tissue from inflammation. Despite of such benefits in our immune system, the bilirubin could haven’t applied into real therapy because of its insolubility. The research team conjugated hyper soluble polyethylenglycol(PEG) into bilirubin to dissolve bilirubin. 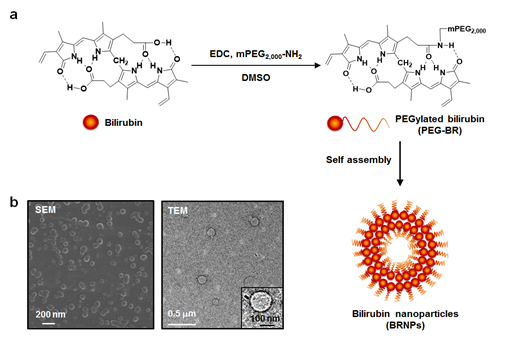 The PEG-conjugative bilirubin is self-assembled in aqueous state to form 100-nm-diameter bilirubin nanoparticle. This bilirubin nanoparticle maintains anti-oxidation and anti-cancer effect but can be emitted. 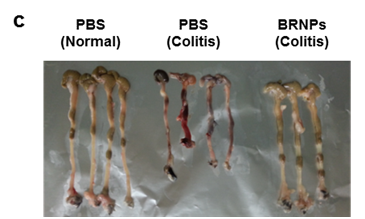 To test the effect of the medicine, colitis-model mouse which is a representative intractable chronic inflammatory disease model has been treated with the bilirubin nanoparticle. As a result, the nanoparticle was selectively located in inflammation region, and the inflammation process was effectively abolished. In addition to, shorten colon recovered as a normal mouse with no side effect. The research team argued that the bilirubin nanoparticle will be used as a general-purpose anti-inflammatory nanomedicine based on effective results in ischemic river disease, asthma, and pancreatic acinus transplanting model mouse. This research is supported by National Research Foundation and KAIST System Healthcare Project.